Between 1981 and 2017, Saimatec was operating as a systems supplier for pulp and paper mills internationally. Main business was roll handling and roll wrapping systems for paper mills. Product portfolio also included products and services for bulk material handling processes, and this is still an important part of Saimatec’s business. 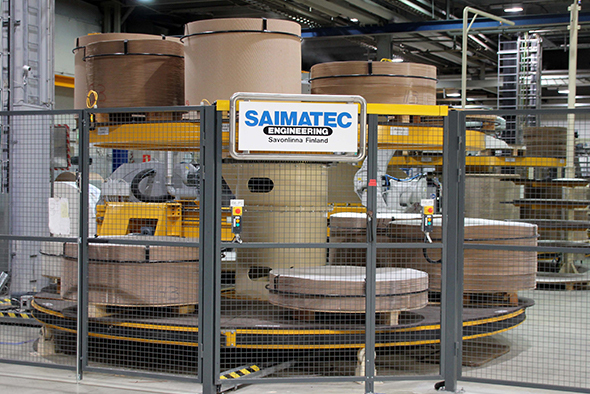 In addition to this, Saimatec owns and develops the Teknola industrial site in Savonlinna, Finland. Founding of Uproval Oy in 2018 is the latest development, which is also related to generational change at company leadership. Roll handling and roll wrapping systems are today delivered by Uproval, please see this section of the webpage. Saimatec was started as an engineering consultancy, operating in co-operation with workshop companies which produced the products designed by Saimatec. • Original business area was roll wrapping systems for pulp&paper mills, but many different products were designed on a contract basis, too. • Gradually over the 1980’s own manufacturing activities and turn-key deliveries were started, and operations were focused on sector of roll wrapping and handling. Machinery workshop Ässätekniikka Oy was founded in 1989. Saimatec and Ässätekniikka form a pair of sister companies. • Ässätekniikka is a separate limited corporation that serves as manufacturing facility for Saimatec’s products, but also as a sub-supplier for other certain other equipment manufacturers not competing with Saimatec. • Majority of Ässätekniikka Oy is owned by Saimatec and Saimatec-related persons. Since 1990 both Saimatec and Ässätekniikka have been operating in the Teknola industrial park in Savonlinna, Finland. • Saimatec owns a total ~11.000 m2 production and office spaces, suitable for design and manufacturing of various products for heavy industry. Ässätekniikka is using major part of the premises. Ässätekniikka Oy no longer operating. Uproval Oy founded in order to continue SAIMATEC roll wrapping and roll handling business. Saimatec continues on fields of biomass / bulk material handling equipment, as well as development of the Teknola industrial site.